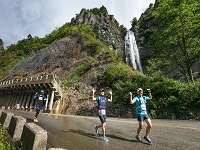 ○Given that it runs from the mountains to the sea and reaches a maximum elevation of about 1,450 m above sea level, this ultramarathon course is one of the most demanding in Japan. ○The course follows Hakusan Shirakawa-go White Road, an expressway that offers a scenic view of the mountains. The road is closed to traffic on the day of the race. 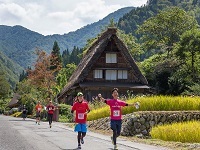 ○Passing through the historic village of Shirakawa-go, which has been designated a UNESCO World Cultural Heritage site, the course gives runners the opportunity to view traditional Japanese houses with steep thatched roofs as they make their way along Hakusan Shirakawa-go White Road. Other notable highlights of the course include not only the chance to enjoy a panoramic view of nature's rich diversity—from the natural beauty of the area's valleys through to the Phantasmal falls and a virgin beech forest—but also an ever-changing landscape that stretches from the mountains to the sea. The sun setting over the Tedori-gawa River alluvial fan and the Sea of Japan is particularly memorable. Presented to the top 6 male and female racers in each race category. *In addition, handling fee 4,000 yen will be charged. * The course and distance may be subject to change depending on the course conditions. * The course, distance and check-point times may be subject to change depending on the course conditions. ■Participation award:Each runner that participates in the race receives a commemorative event t-shirt. ■Finisher's award:Each runner that completes the course is presented with a finisher's medal. ■Finisher's certificate:On the day of the race, a finisher's certificate is issued to each runner that completes the course. Finishing positions and check-point times are posted on the event website. NB: The certificate states only the runner's final finishing time. The event organizer will handle personal information in full compliance with all laws and regulations concerning the protection thereof. Please note, however, that the personal information that you provide may be used for purposes such as the following: the sending of information concerning the event; the provision of details such as your name and the name of your prefectural club for inclusion in the event program and the record list; and the sending of pamphlets for next year's event. ● Signs marking the distance are posted every 2.5 km. ● Aid Water stations are provided along the course at intervals of 3 to 7 km. We also plan to set up rest stations (with changing rooms, food stalls, basic pools, etc.) at a few places along the route. Please note, if you need to reserve accommodation, please contact following travel agent. Runners are expected to make their own arrangements for travelling to the starting point. However, a bus service running from the finishing point of the 100km race to the starting point is provided (payment and reservation required). If you have any unnecessary belongings with you at the starting point, you can have them sent to the finishing point. You can also have a change of clothes sent to the Kawachi Aid Station (59.9 km). You will not be able to do a trial run of the course. Pedestrians and cyclists are not allowed on Hakusan Shirakawa-go White Road prior to the race. The road is open from June until November. At all other times, it is closed. *No Check-in later than the designated period will be accepted. *Please note that the check-in on the race day will not be accepted. *The content of Runner's Briefing ① and ② is the same. ● Read the requirements stipulated on this website carefully and make sure that you understand them before submitting your application. Applicants apply for and participate in this event at their own risk. ● This event is organized in accordance with the rules and regulations of the Japan Association of Athletics Federations. ● Please note, however, that neither this event nor the course is sanctioned by the Japan Association of Athletics Federations. ● False declarations (concerning matters such as age and gender) and participation by anyone other than the applicant (i.e. fraudulent participation) are prohibited. In a case such as this, the participant will be disqualified from the event. The participant may also be banned from participating in future events. 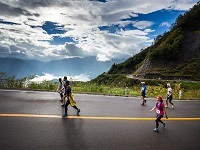 ● In principle, runners are expected to keep to the left-hand side of the road during the race. Please make sure that you comply with Japan's Road Traffic Law. In addition, please follow any instructions issued by course officials. ● In the event of adverse weather conditions or other circumstances outside the event organizer's control, it may be necessary to temporarily suspend the race or to shorten, postpone or cancel it. In such an event, the race entry fee will not be refunded. ● If you are unable to attend the event, your race entry fee and any other expenses you may incur in relation to your participation in this event will not be refunded regardless of the reason. ● Before participating in the race, you must undertake sufficient training and make sure that you have reviewed the content of the health checklist. Participants enter this event at their own risk. ● The event organizer bears no responsibility for the event of illnesses or accidents (injuries, etc.) that occur during the race except the provision of emergency care. ● Camping out at the starting point or the finishing point is prohibited as it would inconvenience local residents and facilities. ◆ If you feel unwell prior to the race, please decline your invitation to participate. If you have any concerns about your physical wellbeing during the race, please have the courage to withdraw from the race. ● The event entry fee includes an insurance premium. ● In certain circumstances, an ex-gratia payment may be paid in the event of a serious injury or death during the race. In such an event, please contact the executive office of the event organizer after the event has ended.